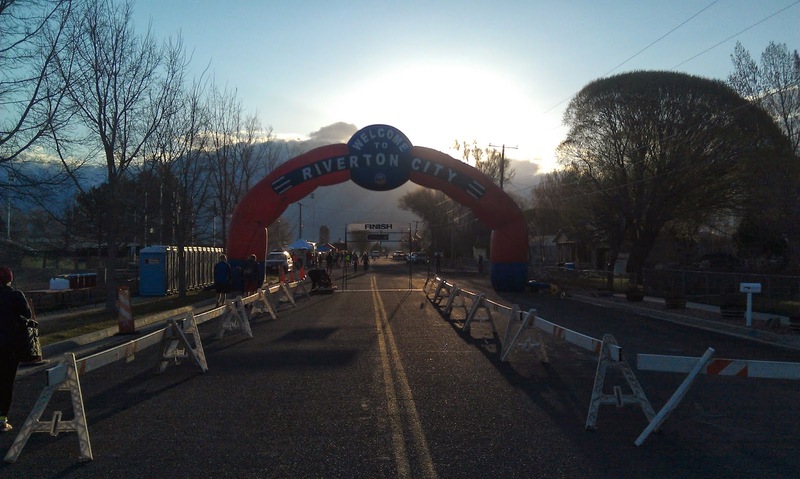 Today I ran the City of Riverton Utah Half Marathon, which is a suburb about 15 minutes drive south from my house in Murray. This race is one of the bigger half marathons and in its fourth year, draws a good crowd and super competitive crowd (the winning time was 1:11, I believe). In a way it felt like the Cary March Madness Half Marathon that I ran at this time of year when I lived in Illinois. This week was pretty much low mileage. Last week's long run pretty much did me in and I have been battling a weird twinge in my right shin along the side. I think there is a tendon along there that is throwing me fits. It isn't really bad, but often times the first couple of steps (or even the first quarter mile) can be painful until it relaxes. It is getting better, though. So I was a bit hesitant on how well it would hold up for the half marathon (which it did - I felt it once or twice, but overall not a problem). First off I finished in about 1:50:47. Given the Honeyville Half Marathon I did a few weeks ago, that time is right on target with what I figured I was capable of doing. Mile 13: 8:34 -- Kicked it in for the final stretch. The weather was in the 40's, sunny and with a bit of a breeze from the north, so basically ideal for racing conditions. I was one of the lighter ones dressed, going with shorts, a short-sleeved tech shirt and gloves. I almost went with another long-sleeved shirt on top of that but I am glad I didn't. If anything I was warm the entire race. 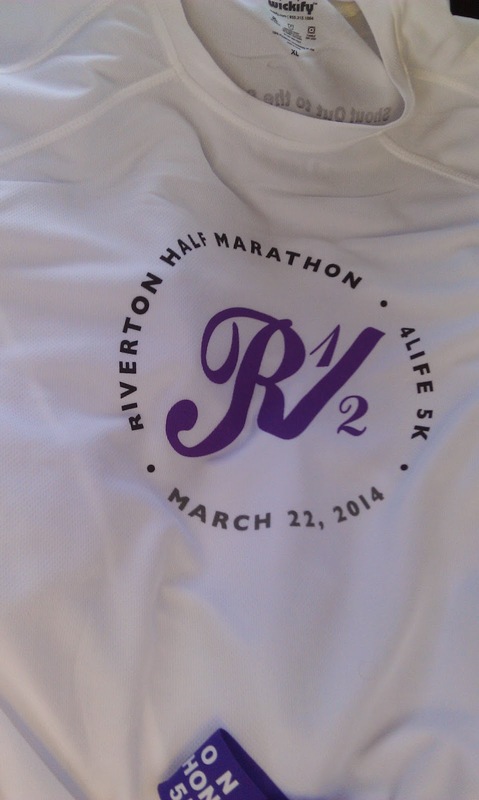 The race starts in downtown Riverton. Riverton is a typical Salt Lake City suburb and looks a lot like the others in the area. This race was wonderfully run, with plenty of bathrooms, and pre and post race goodies. We took off at 9AM as scheduled and the first few miles are through a residential subdivision. There are some rolling hills here but nothing too remarkable. After about 3 miles the race goes to the Jordan River bike trail. I was familiar with the bike trail as when I worked at my previous computer job I used to jump on the trail near this point. It was good to be in familiar territory and it had been a while since I had been this far south on it. We did about a mile north (into the wind) and then turned around and went south. 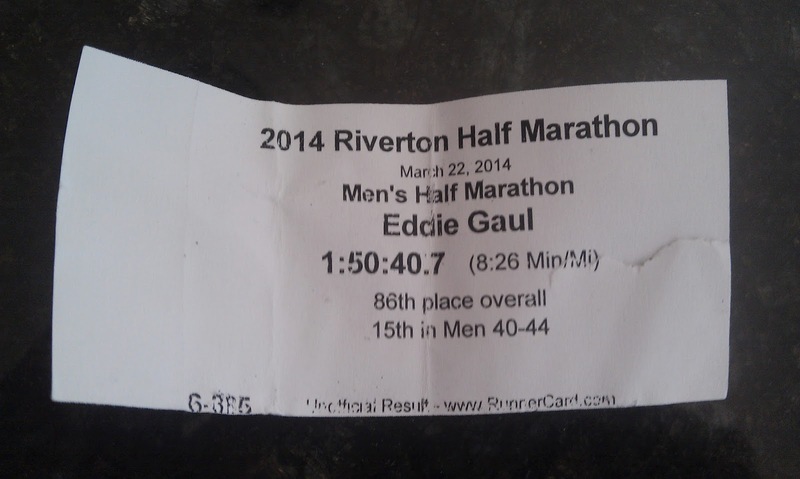 I was in pretty good shape overall but a race this big, I knew I wasn't going to come anywhere in my age division. 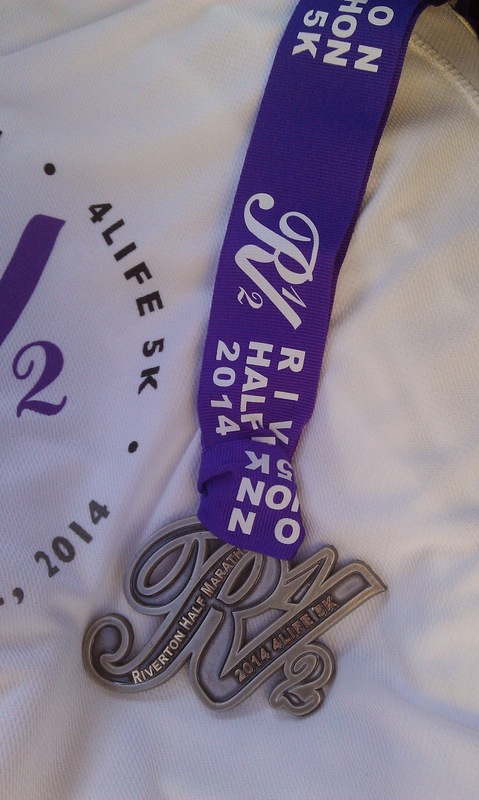 This race was all about personal bests, getting in some quality miles and developing my mental toughness / speed. While I was worried about my initial pace (I went out pretty fast) I was counting on a strategy of banking some time and trying to kick it in at the end would pay off. Also it was time to see what I had and how long I could hold an 8 minute / mile pace. Eventually we went further south along the bike trail then I had ever been on before. Turns out there appears to be some hot springs at about the mile 7 point. At first I thought someone was burning brush but instead it was steam coming off the Jordan River. There were all kinds of signs up warning about severe burns and there was a fence around the springs. I am not sure if the signs were warning of the hot temperature or the fact there was a water treatment plant. Either way, it didn't look hospitable. At about mile 7 I also encountered a nasty hill. It was a "ball breaker" and it took the wind out of my sails, so to speak. So suddenly I was feeling the weight of the earlier miles. There was also another nasty hill around mile 11 that killed my pace and everyone was shuffling up it. You couldn't cut the corner on it either as a police officer was up there making everyone stay to the right as it was an open road. The final few miles were along a service road of some sort. On one side you had what looked to be super expensive houses and on the other there was dilapidated ranches with horses and farm animals. Just an odd contrast (which pretty much describes many Utah neighborhoods). Running into the wind for the last few miles also made it mentally and physically challenging. Overall the race was done very well. They had a nice medal (and some very cool age group awards), the price was "only" $50, which is pretty good for a half marathon (if I had registered a few months ago it would've been $30). The mile markers were WAY off though. Mile 1 was at 1.10 and then after that each mile marker was at .3 miles. So mile 3 was at 3.3. I was worried I was going to have to run a 13.5 mile race. Even at mile 12, the marker was at 12.3 (at least according to my Garmin). Luckily the race measured out to be 13.04. I suspect it was accurate if we didn't run the tandems on the residential roads. I am reasonably happy with my time. Although it appears that I am a bit slower than last year. I finished about 87th overall (considering the size of the race, that isn't too bad) and 15th in my age division. 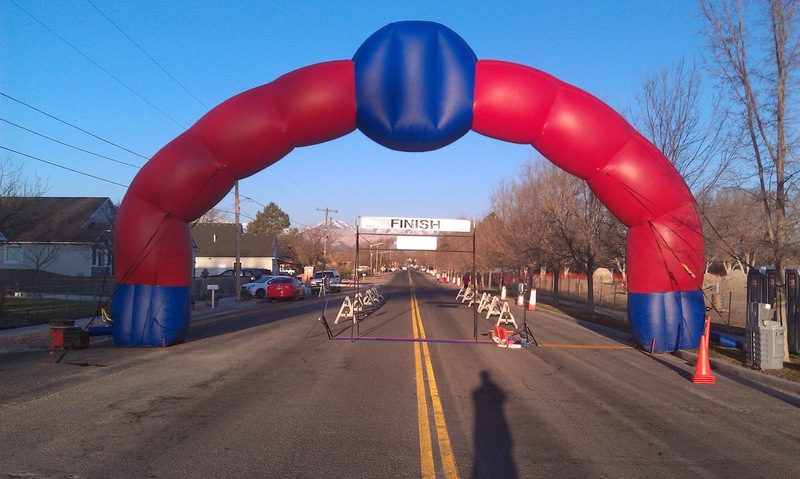 I am sure I'll jump into a 5K periodically as well depending upon time and training schedule. Also, as I was waiting for the race to start I was in the starting corral and low and behold two guys near me (who didn't know each other) were waiting along side. I recognized both of them from frequent runners on my local bike trail. It was good to get a name and a "Howdy, I've seen you on the trail". Slowly making running connections here.